The Comcáac, meaning “the people” in their native tongue—more commonly known as the Seri—are a small indigenous community living on the northwest coast of Mexico along the Gulf of California (Sea of Cortés), a desert land of stark beauty. Their traditional territory includes the island Tahéjöc, known in Spanish as Isla Tiburón; the neighboring island Coftécöl; and the approximately 150-mile stretch of coastal mainland from Puerto Lobos to Guayamas. Their connection to their natural surroundings is so profound that they regard their land as their body: the mountains and rocks are their bones, the soil their skin, the sea and rivers their blood, and the wind their breath. Their relation to the sea turtles is particularly central to their culture, as Gabriel Hoeffer, a turtle conservationist, explains: “We believe there was one god, who was also the god of the Comcáac who ordered the animals to dive for some sand to use to construct the world. Many of the animals tried until they could no more, and then there was the turtle. When it was his turn to find the sand, he dove down and buried himself. He surfaced with the sand, and with that sand the world was created.” For millennia the Seri have cared for and been sustained by this land, but the rapid developments of the 20th century have brought challenges to their traditions and to the health of their environment. Yet it is their traditions and stewardship that have protected the environment and preserved biodiversity to this day—a fact that is now being recognized by international and conservation organizations, bringing hope that all life in the Comcáac lands will continue to thrive. Based on archeological evidence, the Seri are believed to have lived in the present-day Mexican state of Sonora for as many as 2,000 years. At its peak, the Seri population likely numbered several thousand people living as nomadic hunter-gatherers, moving among encampments on the mainland and the islands. From the 17th through the early 20th centuries, warfare with neighboring indigenous tribes and Spanish and Mexican colonizers, along with the introduction of foreign diseases, pushed the Seri to the brink of extinction. In the late 1800s and early 1900s, the Mexican military and settlers wiped out at least half of the surviving Seri, who for the most part refused to be resettled, become farmers or convert to Christianity. Survivors took refuge on Tahéjöc, where they successfully defended themselves. By 1930, the population was reduced to fewer than 200 people, but it has since rebounded to between 650 and 900. Despite the centuries of European pressure, the Seri maintained their hunter-gather way of life until well into the 20th century. In the 1930s the Seri became involved in commercial fishing—which the Mexicans had started a decade earlier—and one of their traditional fishing camps became a village. Tourism increased after 1960, and the Seri shifted to a cash-based economy, primarily through the sale of artwork, especially ironwood carving, which became popular with visitors. In 1970 the Seri were granted ownership of their two established villages and the surrounding coastal lands. In 1975 they obtained legal land rights to Tahéjöc— which the government had in 1963 designated as the first nature preserve in the Gulf of California—along with fishing rights to the Infiernillo Channel, which runs between Tahéjöc and the mainland, and the waters of the adjacent islands. 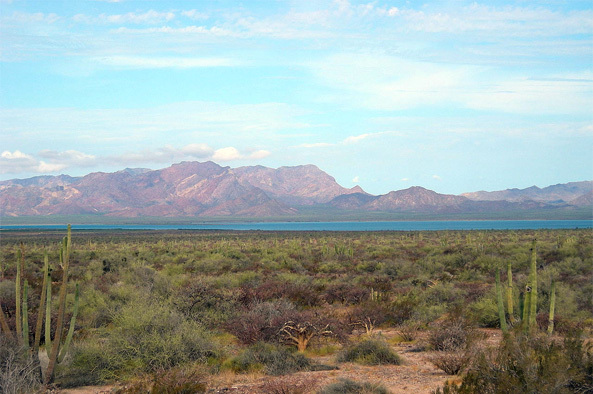 The Seri live where the extremely hot, rugged Sonora desert meets the Gulf of California—a region both harsh and biologically rich. Its waters host 34 marine mammal species, including blue and fin whales and one of the world’s most endangered cetaceans, the Vaquita porpoise. Loggerhead, hawksbill, leatherback, olive ridley and green sea turtles thrive in the warm gulf waters as well. Its islands provide important nesting sites for migratory birds and breeding grounds for sea lions. The desert hills are home to the world’s two largest species of cacti—the Sahuaro and the Cardon—which reach as high as 45 feet. Dozens of species of reptiles and numerous mammals, including jaguars, roam the land. To survive in this harsh desert environment, the Seri became experts in the ecology and biology of their land, making use of the vegetation, game and abundant sea life and incorporating this knowledge into their stories, songs and religion. Today, the community continues to rely on food, especially the sea grasses upon which both the turtles and the Seri depend, from the surrounding marine and land environment. They developed their own biological classification system, naming more than 400 plant species, including some 100 used for medicinal purposes. They also amassed a large body of knowledge regarding the biology and behavior of sea turtles. One traditional four-day ritual was a welcome for the annual arrival of the leatherback turtle, a creature the Seri believe was present at the time of the creation of humans. The traditional Seri religion is based on shamanism and vision quest. Strictly speaking, the Seri culture regards only sites associated with transcendental rituals as sacred, and the community closely guards its knowledge of these places. Many other sites, however, have deep spiritual and cultural value; their protection is just as important, and the community refers to them as “sacred” to impart to outsiders the magnitude of their value. These sites include places where great battles took place or where ancestors found shelter, and locations harboring species that have sustained the Seri people. Tahéjöc has particular importance because in this place Seri ancestors shed their blood in defense of the people and their culture. According to one of the creation stories, Tahéjöc is where the first Seri were formed, and its natural features embody the Seri cosmovision. Today the Seri’s sacred beliefs are an integration of ancient legend and their more recent survival story. In the past the Seri fervently resisted Spanish-Mexican influences, and today they are managing to sustain their culture by adapting and taking advantage of new opportunities. Their knowledge of desert plants and sea turtle biology aids in resource management and conservation practices—making the preservation of Seri culture a key to preserving biodiversity. Many of the plants and animals of the Seri lands are considered threatened or endangered. In recent decades habitat loss, the harvesting of turtle eggs from beaches, and commercial fishing have decimated five once-abundant sea turtle species. The Seri have not seen a leatherback turtle in 30 years, as standard commercial fishing nets accidentally capture the turtles before they reach the beaches to lay their eggs. Jeff Seminoff, a marine biologist working with the Seri, explained in the film Canciones de Sobrevivencia, “There’s a lot of poaching that goes on in the world, especially in Mexico, and the problem is that on the black market, turtles are sold for a very high price, so there’s lot of demand, and a fisherman that might make a $100 a week fishing his normal catch can make a $1,000 a week fishing for turtles.” The Mexican government banned the commercial sale of sea turtle products in the early 1990s, but it preserved the right of the Seri to capture green sea turtles for ceremonial purposes. Grupo Tortuguero Comcáac (Comcáac Sea Turtle Conservation Group) is a youth custodianship program created in 1999 by a collaboration of Seri elders, western scientists and conservationists. The group members, whose average age is 21, monitor sea turtle populations in the Infiernillo Channel to document the human impact on turtle populations; patrol and release illegal captures of sea turtles; increase awareness and participation of Comcáac tribal members in global conservation efforts; revive traditional ecological knowledge; and explore economic alternatives that promote sustainable livelihoods and support marine conservation. According to the Seri Council of Elders, the loss of traditional knowledge is the main threat facing the community. To address this challenge, in 1999 they founded a “traditional school” to teach Seri history, traditional practices and protection of local lands and resources. The effort includes compiling written documentation of Seri culture and producing videos to record traditional songs, dances and folk stories. In June 2007 Antonio Robles Torres, president of the Council of Elders, received Mexico’s National Prize of Ecological Merit for his work. In 2002 Seri elders began working with the global conservation organization WWF to locate and map sites of Seri cultural significance on Tahéjöc and the mainland. For each site that is identified, an elder shares traditional stories associated with it, especially those stories that relate to the management of the site’s natural resources. This work, published by the Instituto Nacional de Ecologia in 2006, identified and mapped 118 sacred sites, divided into three types of sites: those in honor of heroes, those where revelations occurred and those where rituals are performed. The results are being incorporated into land-use plans for Seri territory and included in the curricula for the traditional school. In recent years the Seri have received broader international support for their work toward cultural and environmental conservation. In March 2006, the U.N. Environment Program announced World Bank financial support for protecting sacred sites on Tahéjöc for the purpose of preserving international biodiversity. In the years to come, tourism may pose the greatest threat. The government is planning to build a coastal road connecting Mexican beach towns to the north and south of Seri territory, to be completed by 2009, which would open the floodgates of development and potentially transform the area into another Cancún. Through official ownership of their lands and the rights to manage land and fishing, the Seri are able to exercise a certain degree of autonomy. For example, Seri traditional guards oversee the sustainable use of natural resources, and they are recognized by Mexican law enforcement agencies. They are also able to generate income from their territory through ecotourism; fishing; craft work, such as basket weaving, derived from natural resources; and the sale of licenses—which go for $50,000 or more—to hunt bighorn sheep, introduced to Tahéjöc decades ago. Still, they must work within the framework of national laws that are typically created without the consultation of Seri leaders and are often at odds with the needs of the people. Researchers and community leaders cite the need for a long-term, sustainable community economic development plan, one that would ensure complete self-management of cultural and natural resources. Seri elders also note the need to provide youth education that prepares them to tackle the socioeconomic challenges of the future. To get involved with the protection of the Comcáac environment and the sea turtles of the Gulf of California, contact Daniel Durazo at the conservation group Pro Península, which works with the sea turtle conservation network Grupo Tortuguero. You can also visit the Grupo Tortuguero and Pro Península websites for information about volunteering, making a donation, and other ways to help. Blystone, Peter, Laura Monti, Erica Molina and the Grupo Tortuguero Comcáac. Canciones de Sobrevivencia: Los indios seri y su protección a la caguama en el Mar de Cortés, video. Felger, Richard Stephen and Mary Beck Moser. People of the Desert and Sea: Ethnobotany of the Seri Indians. University of Arizona Press, 1985. Grupo Tortuguero Comcáac. Grupo Tortuguero Comcáac. Johnston, Bernice. The Seri Indians of Sonora, Mexico. University of Arizona Press, 1980. LaDuke, Winona. “Saving the Seri Sea Turtles.” AlterNet, Nov. 7, 2005. Luque, Diana and Mercedes Otegui. “Tahéjöc: The Comcáac Sacred Space.” Paper presented at the fifth IUCN World Parks Congress, Durban, South Africa, Sept. 8-17, 2003. Luque, Diana and Antonio Robles Torres. Naturalezas, Saberes y Territorios Comcáac (Seri). Instituto Nacional de Ecología, 2006. Monti, Laura and Bea Jacobs. The Seri Comcaac Indians. Moser, Edward W. “The Seris.” Instituto Lingüístico de Verano, 1976 (updated 1996). Nabhan, Gary Paul. Singing the Turtles to Sea. University of California Press, 2003. Nauman, Talli. “Seri Indian turtle protectionists act in ocean’s best interest.” The Herald Mexico, June 13, 2006. Spano, Susan. “Untamed, but for how much longer?” Los Angeles Times, Jan. 8, 2006.